A quirky, cheeky, and bright line of letterpress cards headed up by Eunice and Sabrina in San Francisco, Hello!Lucky boast several designs in our top faves at Copperfield’s. Eunice and Sabrina started out on a hand-cranked press 13 years ago, and today produce a line of cards characterized by humor and wit, with a dash of neon ink and a foil highlight or two. 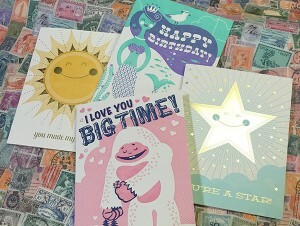 We offer several occasional cards from Hello!Lucky, including Birthday, Congratulations, and Consolation, as well as Thank You and Love cards. If you love letterpress cards, but you’ve got a sense of humor and an appreciation for contemporary design, Hello!Lucky has got something for you!